General of the Army Dwight David ("Ike") Eisenhower (1890-1969) was an esteemed career soldier who was the top Allied commander in Europe in World War II, rose to the rank of Five Star General and who served as the 34th President of the United States of America. (1953-1961). He first commanded Allied (British and American) troops invading North Africa in 1942 and Italy 1943, then became the Supreme Allied Commander of the forces that invaded Normandy on D-Day, June 6, 1944, and defeated the Germans in the West. As the great American hero of the war, both parties wanted him as a presidential candidate. He kept out of politics until 1952, but was increasing hostile to the liberalism and corruption of the Truman Administration. In 1952 Ike argued for a vigorous anti-Communist foreign policy in defeating the isolationist Senator Robert A. Taft for the Republican nomination and was elected by a landslide. As president he followed conservative economic policies recommended by Taft, but continued what was left of the New Deal and expanded Social Security. In foreign policy he kept the containment policy in the Cold War and ended the Korean War. Eisenhower sponsored the Interstate Highway System, signed the first civil rights bill in 82 years, and promoted domestic policies known as "dynamic conservatism". He repeatedly warned against deficit spending but launched no great moral crusade, nor did he engage in an idealistic pursuit of some overriding national goal. Critics led by Democrat John F. Kennedy charged that Eisenhower was quite content to preside over a fat, happy, satisfied nation that devoted itself to the good life. Eisenhower largely ignored partisan politics, leaving that to his Vice President Richard Nixon, who was defeated in 1960 by Kennedy when he tried to run on the achievements of the Eisenhower administration. Eisenhower was born David Dwight Eisenhower in Denison, Texas, on Oct. 14, 1890 of Pennsylvania Dutch heritage. The name his parents gave him at that time was David Dwight Eisenhower - a name that wasn't switched to its more familiar form until the time of Eisenhower's enrollment at West Point. His father, David Jacob Eisenhower, was of Bavarian Mennonite descent; his mother, Ida Elizabeth (Stover) Eisenhower, was of Swiss descent. The families of both parents came to America prior to 1750. Three hundred "River Brethren," including his father, moved to farms in Kansas in the 1880s. His parents were college educated, but lost their inheritance and lived poor working class lives in Abilene (apart from a short stay in Texas where Ike was born). Ike maintained close ties with Abilene his entire life. There he grew up in an environment of strong family religious traditions; his father was distant, known only as a harsh disciplinarian, but his mother had a level of activism and a sparkle in her eye that Ike inherited. In the 1890s his parents left the Mennonites to join the Jehovah Witness religion, a highly controversial group because of its refusal to salute the flag. His mother was a leader of the Witnesses but Eisenhower was never a member. Eisenhower had six brothers; they all had successful careers. The oldest, Arthur, became a banker; Edgar a lawyer; Roy a pharmacist; Earl an electrical engineer; and Milton a New Deal official, became president the Johns Hopkins University and a close adviser to Ike. Eisenhower was well educated in the small city's public schools and graduated from Abilene High School in 1909. He told a party rally that year that he was a Democrat. Despite the strong pacifist sentiment in the community, Eisenhower entered the U.S. Military Academy at West Point in 1911. Cadet Eisenhower was outstanding as a football player until he injured a knee in his sophomore year. He became a student coach with a deep knowledge of the game and for the next decade was in demand as a football coach at different army posts. His academic performance was average and he was commissioned a second lieutenant in June 1915 in the "class stars fell upon." The World War was underway in Europe, but it made little impact on the West Point curriculum, which was oriented toward military engineering and history, and above all to complex teamwork (and a disdain for politicians). The new second lieutenant was assigned to the prestigious 19th Infantry Regiment at Fort Sam Houston, San Antonio, Texas. There he met Mamie Geneva Doud, daughter of a prosperous Denver, Colorado, family. They were married on July 1, 1916; Eisenhower was promoted to first lieutenant the same day. They had two children, a boy who died in infancy, and John Sheldon Doud Eisenhower, who became an Army career officer. During World War I Eisenhower, a permanent captain and a temporary lieutenant colonel, commanded 10,000 men at the Tank Corps training center at Camp Colt, Pennsylvania; he later built his Gettysburg farm home nearby. He was preparing to sail for France when the armistice took effect on November 11, 1918, so he did not see combat. He had, however, achieved the number three rank in the Tank Corps; his close friend George Patton was number 2, and did see combat in France. After the war, Eisenhower reverted to the permanent rank of major—one he was to hold for 16 years. In spring 1919, took part in the army's Transcontinental Convoy designed to demonstrate the need for better roads and a transcontinental highway system. The entourage left from Washington and followed a route that approximated the planned Lincoln Highway. The "truck train," as Ike called it, consisted of 81 military vehicles, 37 officers, several hundred enlisted personnel, and numerous civilian vehicles. The army vehicles included one small tank, which was the responsibility of Eisenhower and his friend, Major Sereno Brett. An estimated 3.5 million people viewed the convoy, which arrived in San Francisco in September. Among the lessons learned by the military was that they needed more durable vehicles and better maintenance procedures; it also gave him the idea for a national highway system that would facilitate troop movements. After commanding several units in the fledgling Tank Corps, the Corps was disbanded and Eisenhower was told that his theorizing about the use of armor in future wars would jeopardize his career as an infantry officer, so he stopped. In 1922 he became executive officer of the 20th Infantry Brigade in the Panama Canal Zone, where he had many in-depth conversations with his first mentor General Fox Connor, an intellectual who had been a top aide to General John J. Pershing. Eisenhower recalled the experience as his "graduate school of military affairs." In 1924 Eisenhower graduated first in his class of 275 from the Army Command and General Staff School, a signal that he was among the half-dozen most promising young officers in the army. He also graduated from the Army War College. Assigned to Pershing's Battle Monuments Commission, he went to France twice and wrote a guidebook to the French battlefields, and added Pershing's mentorship. In late 1929 he was assigned to the office of the assistant secretary of war. He served three years in this critical position. A specialist on logistics and supply, he largely wrote the Army's "Industrial Mobilization Plan of 1930." (It was not, however, used when the war came.) Eisenhower moved up to the office of Chief of Staff, becoming an assistant to General Douglas MacArthur, a mentor whom he greatly admired at the time. When MacArthur was sent to the Philippines in 1935, Eisenhower accompanied him as assistant. There Eisenhower helped create the Philippine Army, specializing in its air force. He earned pilot's wings and a lieutenant colonelcy. Holland (2001) argues that Eisenhower was the best read and trained officer of his age in the interwar Army and possessed a "terrific intellect." Far from being an unknown, his talents and work ethic attracted the attention of some of the Army's most important senior officers, especially Connor and MacArthur, who mentored Eisenhower and boosted his career. Indeed, he benefited from such attention more than any other officer of the era. Back in the United States in early 1940, he served as chief of staff of the Third Division and the Ninth Army Corps, and then of the Third Army. In this capacity, he had a large part in the tactical planning of the Louisiana war games of 1941. He won notice and rapid promotion to colonel and brigadier general. Eisenhower became the protégé of Chief of Staff George C. Marshall, serving in the office of the chief of staff as chief of the plans division and was named a major general. His first task was planning the Army's defensive role against Japan. American strategy called for defeat of Germany first, and in early 1942 Eisenhower took charge of planning its implementation. This brought him into repeated conflict with Chief of Naval Operations Ernest J. King, who wanted to shift most of the Navy's resources to the Pacific, stripping Europe of the landing craft Eisenhower needed. After a survey trip to Britain, Eisenhower was appointed commander of U.S. troops in Europe. Now a lieutenant general with three stars, he took charge of "Operation Torch" the Allied invasion of French North Africa. The landings there on November 8, 1942, met with merely temporary resistance from the French, and agreements with French Vichy leaders soon brought about Allied control of French North Africa. Eisenhower had been too cautious and landed too far west, which prolonged the campaign. After an unexpected defeat at Kasserine Pass, Eisenhower's forces crushed the Germans and Italians from the west while British General Bernard Montgomery mauled them from the east; the enemy surrendered in May 1943. Eisenhower next supervised the Allied invasion of Sicily (July, 1943), in which the enemy escaped with all their soldiers and supplies. Eisenhower then led the invasions of mainland Italy (September 1943), which quickly bogged down. Despite numerous strategic mistakes, Eisenhower was learning, and he was pushing the Germans back. He tended to run his command through committees and distanced himself from day-to-day decisions, delegating responsibility to subordinates and rarely interfering. His genius was in understanding how to make coalition warfare work in both the military and political spheres. Eisenhower proved adept at dealing with the British and French, while wary of a possible German counterattack through Spain (which never happened). His tactical military successes, and especially his ability to lead and coordinate the efforts of all the Allied forces and to smooth over inter-Allied rivalries, led to Eisenhower's appointment in December 1943 as commander of the Supreme Headquarters Allied Expeditionary Forces in Europe (SHAEF). This was the command charged with leading the largest, climactic Allied push of the war—the invasion of France. Marshall himself wanted the job, but President Franklin D. Roosevelt insisted on Eisenhower. Eisenhower molded the giant force that on June 6, 1944, landed on the beaches of Normandy. Although meeting fierce German resistance, his command of the air meant the Germans were immobile and could not be resupplied. Eisenhower's the forces broke through at St. Lo (July 18, 1944), and landed also in southern France (August 15, 1944). The Germans rapidly retreated to Germany, many escaping through the Failaise Gap that the American field commander, General Omar Bradley, had failed to close. The liberation of Paris on August 25, 1944, seemed to herald a quick end to the war. But a German counterattack, called the "Battle of the Bulge" in the Ardennes in mid-December 1944, caught the Allies by complete surprise. This time bad weather grounded the Allied air forces, but the Germans were stunned to discover that Allied artillery used proximity fuzes that made its barrages much more effective. Eisenhower had fought the Pentagon to get those fuzes (which Washington feared would be reverse engineered by the Germans and so should not be used.) The Battle of the Bulge was won when the skies cleared, but cost 77,000 casualties, the highest toll in U.S. military history. Finally on March 6, 1945, the Allied forces crossed the Rhine. They cleared the Ruhr Valley region and reached and bridged the Elbe River. Eisenhower declined to advance on the political target of Berlin, because the casualties would be too high and the Soviets had been assigned that task. He instead focused on destroying Nazi forces in central and southern Germany. This decision was controversial, but led to a quick collapse of Nazi Germany, which surrendered on May 8, 1945. Following the breakthrough in France in August 1944 an argument broke out between the Eisenhower, and the Commanding General of the 21st British Army Group, General Sir Bernard L. Montgomery. Montgomery argued that a concentrated attack, which he would lead, on the northern line of advance was preferable to Eisenhower's two-pronged broad-front advance. When Eisenhower decided that as of 1 September 1944 he would assume command of the ground troops from Montgomery, the temporary ground forces commander, the debate widened to include command. Except for Operation MARKET-GARDEN, Eisenhower did not take seriously Montgomery's single-thrust proposals. Eisenhower entered the war ignorant of the intricacies of intelligence gathering; by 1944 he was a highly sophisticated and effective user of massive amounts of secret information from American and British sources. Throughout the European campaign he had almost as good a grasp of German order of battle as Hitler's staff, and sometimes better. He learned from Ultra and other deciphering of German messages; he was also informed by anti-Nazi Europeans outside Germany (although he did not have spies inside Germany). He relied too much on signal intelligence gathered by Ultra's monitoring German radio messages, and thereby was taken by surprise by the Battle of the Bulge, because the Germans used land lines for telephone and telegraph messages. Eisenhower became skilled in deceiving the Germans about Allied strength and possible landing sites. He pretended that the Normandy landing was a feint and that Pas de Calais and Norway were the real invasion sites, and the Germans bought the deception and misdirected their forces. Eisenhower used well the covert operations of the French Resistance. After duty in charge of the American zone in Germany, and a tour as chief of staff of the Army (Nov. 1945- Feb 1948), Eisenhower retired from the service. His war memoir, Crusade in Europe (1948) was a financial and critical success. He became president of Columbia University in New York (1948–50), but his heart was in world affairs, not academia. The 1951 appointment of Eisenhower as NATO's first supreme allied commander, Europe (SACEUR) was crucial to the alliance's success. Eisenhower was the only individual with sufficient military and political stature to persuade Western Europe to rearm in the face of the Soviet threat. While not completely successful - NATO's combat strength did not reach the desired totals - Eisenhower spent 18 months visiting member countries and organizing available military forces. When he left NATO in 1952 to run for president, the organization was planning an ambitious expansion, including the entry of Greece and Turkey into the alliance and the rearming of the Federal Republic of Germany. Eisenhower was convinced that America's own security depended on its commitment to NATO. He was therefore outraged by the isolationism of the leader of the GOP in Congress, Ohio Senator Robert Taft. In February 1951, Eisenhower met privately with Taft, seeking the senator's assurance that he would support America's commitment to European collective security. Taft refused, and the die was cast for Eisenhower's entry into the 1952 presidential contest to stop Taft and guarantee an internationalist commitment. Numerous Republican politicians in the Northeast, led by New York Governor Tom Dewey and Massachusetts Senator Henry Cabot Lodge, Jr., along with media leaders, urged Ike to run, and set up Ike Clubs that sounded a drumbeat of popular demand. Taft was adding delegates; he had about 450 of the 604 needed for the nomination, but Eisenhower delegates were also being elected in the primary, despite the leader's indecision. Finally, with his reorganization of NATO accomplished, Eisenhower entered the race in Abilene on June 4, intending, as he always did, to win. He stood for internationalism in foreign affairs—basically a continuation of the Roosevelt-Truman policies. On domestic affairs he was conservative and pro-business, though he did not attack labor unions the way Taft did. Most of all he stood for new leadership and for a level of competence the nation had been missing for eight years. After ousting some Taft delegates the convention nominated Eisenhower, who chose young Senator Richard M. Nixon as his aggressive running mate. Eisenhower and Taft came to terms, and the GOP ran a united campaign. Eisenhower crusaded against the multiple failures of the Truman administration at home and abroad, summed up as "Communism, Korea and Corruption." His campaign made heavy use of the catchy slogan "I Like Ike"; it became an animated TV commercial produced by Roy Disney and the Citizens for Eisenhower-Nixon. Truman's popularity had collapsed because of the failure to end the Korean war. Late in the campaign Eisenhower electrified the nation by promising "I Shall Go to Korea" (and thus promising to end the war quickly). This speech is one of the rare instances when a single address is credited with having a decisive effect upon a presidential election. Though Eisenhower's personal stature seemed to validate the promise of his declaration, the public response additionally derived from four elements that formed a major portion of the conceptual, emotional, and interpretive manner by which voters in 1952 perceived and acted upon their world: 1) the Cold War discourse as it had been practiced from 1946 to 1952, making it the nation's greatest challenge; 2) the foreign policy debate discourse, especially as it related to involvement in Asia; 3) the Korean War discourse as practiced from 1950 to 1952, in which the GOP was free to denounce Truman because Congress had never been asked to approve; and 4) the discourse of Eisenhower from 1942 to 1952, portraying the joyful warrior, particularly the 1952 campaign discourse featuring an appeal to character. Because of this complex context, the speech was a decisive event. Once in office Eisenhower threatened to use nuclear weapons unless the Chinese came to terms on the issue of prisoner exchange, which they promptly did. Journalists in the 1950s depicted Eisenhower as a laid-back "chairman of the board" who let his subordinates run the government. The opening of Eisenhower's papers surprised scholars, who discovered that behind the scenes Eisenhower was a hands-on leader. He ran the show in his White House, not Sherman Adams or John Foster Dulles. He was well informed, on top of the issues, and possessed of an impressively analytic mind and a formidable capacity for clear, incisive expression in literate prose that is worlds apart from his opaque press conference locutions. He emphatically was the engine of his presidency who watched details and made all the major decisions. As a consequence Eisenhower's ratings by historians and political scientists rose from 22nd place in the 1962 Schlesinger poll to 12th place in the 1981 David Porter poll to 9th in Steve Neal's 1996 poll. Truman, bitterly unhappy with his own White House staff, joked that when Ike became president he would push a button and nothing will happen. Truman was wrong, for Eisenhower was the best organizer in the Army, and he redesigned the White House staff and the executive departments so he had clear control at all times, and brought on board talented senior staff to oversee the process, such as former New Hampshire governor Sherman Adams, his chief assistant from 1953 to 1958. Eisenhower did not have the votes in Congress to dismantle the New Deal. In general he did stop their expansion. He expanded Social Securitycoverage, allowing Republicans to claim some credit for a very popular program. Civil rights for blacks had appeared on the national agenda, but Eisenhower did not give enthusiastic support to the Warren Court decision in the Brown case in 1954 which outlawed school segregation. Eisenhower did approve a weak Civil Rights bill in 1957. When Governor Orval Faubus defied a federal court order regarding school integration in Little Rock in 1957, Eisenhower nationalized the state National Guard and sent in elite Army combat troops to enforce the court orders. Eisenhower successfully integrated the military during his first term (a process begun by Truman in 1948), and integrated the public schools in the District of Columbia. Eisenhower tried to privatize federally provided electric power, which he viewed as inefficient and as a form of 'creeping socialism.' Eisenhower, however, had a difficult time dismantling public energy services due to the New Deal legacies of the Tennessee Valley Authority (TVA) and the Rural Electrification Administration (REA), which provided cheap power to millions of people and had bipartisan support. Eisenhower did not completely destroy public energy utilities; rather, he contained them, limiting the geographical expansion and funding of the TVA and allowing private investors access to new sources of hydroelectric power, as well as the development of nuclear power. Republican Senator Joe McCarthy transformed the national discourse to a focus on internal treason by charging in 1950 that Roosevelt had allowed Soviet spies into the government (such as Alger Hiss), and that by protecting them Truman was guilty of "20 years of treason." When Eisenhower was elected McCarthy turned his attention to Eisenhower's administration and hinted at "21 years of treason." His main case was a reserve dentist who was recalled to active duty and promoted to major, even though he was a member of the Communist party. "Who promoted Major Peress??" he shouted. Eisenhower would not tolerate government employees who failed loyalty or security standards, but stressed his support for civil liberties and proper procedures. He succeeded in using behind-the-scenes tactics to undermine McCarthy, particularly after January 1954 when the senator took on the US Army. Eisenhower's shrewd plan included making political speeches about what his administration had done to remove Communists from the executive branch. Among other things, the president denied McCarthy access to certain White House documents, supported anti-McCarthy Republicans in the Senate, and publicly denounced McCarthy's methods without naming the senator. In October, 1954, the Senate censured McCarthy for bringing disgrace on that body, and he disappeared from the scene. Viewing the limited war in Korea as a mistake, Eisenhower believed that American national security and containment of Communist expansion could best be achieved through nuclear deterrence and the utilization of other assets, such as negotiations, psychological warfare and economic aid. Eisenhower worried that excessive defense spending would weaken the economy in the long-run, and thus be counterproductive. His "New Look" strategy economized by cutting back on Army divisions (much to the chagrin of the soldiers), and emphasizing instead nuclear weapons, which gave "more bang for the buck." During his first three years as President, Eisenhower cut the federal budget, largely by controlling defense expenditures. By nature a fiscal conservative, he had no patience for corporate contractors' insistence that America needed ever more defense systems, even when the point was made by his Secretary of Defense, Charles E. Wilson, a former CEO of General Motors. Wilson was ridiculed by Democrats for his garbled statement, "I thought that what was good for our country was good for General Motors and vice versa." (He meant to say what was bad for the country was bad for General Motors). Wilson proposed enormous Pentagon budget requests that Eisenhower slashed back. The number of uniformed personnel dropped from 3.6 million in 1953 to 2.5 million in 1960; another 300,000 civilian jobs in the Defense department were ended. The overall military budget dropped from $43.8 billion in 1953 to $41.3 billion in 1960, or from 12.0% of GDP to 8.2%. In effect Eisenhower cut the military by 30%. Eisenhower rejected the policy of limited war and use of tactical nuclear weapons to the strategic menu of ways to deal with the Communist threat, and instead adopted a new strategy of "massive resistance" whereby a small war with the Soviet Union would immediately turn into a major nuclear war. He knew the U.S. had substantial nuclear superiority. The effect was to deter both sides from any action that might escalate tensions into a small war. Eisenhower thus avoided World War III. Between 1953 and 1955 Army leaders, headed by Chief of Staff General Matthew B. Ridgway, attempted to overturn Eisenhower's New Look. Ridgway believed that the new policies were militarily unsound and ultimately rendered military professionalism unnecessary by eliminating the political utility of force. Determined to salvage the military profession, Ridgway tried to undermine the credibility of Eisenhower's policies. Eisenhower, however, had much greater military and political prestige and replaced him in 1955. Eisenhower likewise rejected criticism from his next Army chief of staff Maxwell Taylor. Taylor wanted more money to achieve more flexibility, but Eisenhower got his way. Eisenhower had a triad of nuclear delivery systems (the B-52 bomber, submarines, and missiles), added an early warning radar system in Canada, and tried to add a civil defense system for cities in case deterrence failed, but the public was completely uninterested in his bomb shelters. He strengthened the Secretary of Defense and the Joint Chiefs of Staff at the expense of the traditional service chiefs. At the time there were no intercontinental missiles, and the American air defense system was considered strong enough to fend off any Soviet air attack. American progress in rocketry was upstaged by the Soviets in 1957, as they launched Sputnik, the first earth satellite, and kept their lead in space for several years. Everyone realized that gave the Soviets a lead in long-range missiles as well. Much of Eisenhower's energy in 1953-54 was devoted to defeating the "Bricker Amendment," a constitutional amendment proposed in 1951 by Republican Senator John W. Bricker of Ohio. It would restrict the president's role in entering into treaties, threatening both presidential authority and America's new internationalist role in foreign affairs. Eisenhower was annoyed that the core of legislative support came from within the Taft wing of the GOP. The Bricker Amendment grew out of opposition to the perceived threat of United Nations intervention into domestic social, economic, and political affairs - the UN's "global socialism." Through strong personal lobbying and rescinding support for human rights treaties, Eisenhower and his congressional allies narrowly defeated the Bricker Amendment, and this effectively eliminated the strength of isolationism in the postwar period. 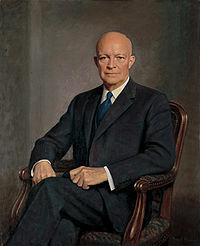 Concerned over Communist subversion, Eisenhower created the Eisenhower Doctrine to support pro-Western Arab governments. At first the United States did not distinguish between Communism and radical Arab nationalism, perceiving Egyptian president Gamal Abdel Nasser as linked to Soviet encroachment. The political situation grew complex as radicals challenged the Lebanese and Jordanian governments, and the ruler of Iraq was brutally overthrown. In 1958 Eisenhower sent Marines to Lebanon to support the government but balked at British plans for greater military intervention. Eisenhower and Secretary of State John Foster Dulles eventually focused their strategy by distinguishing between Communism and Arab nationalism. The United States was able to limit its goals, accommodate itself to Nasser, and display a greater flexibility than the Eisenhower Doctrine originally offered. At the same time relations with Israel were greatly strengthened, which annoyed America's Arab allies. Scholars have spent a half century debating why the Eisenhower administration helped the Guatemalan army overthrow the Jacobo Arbenz Guzmán left-wing anti-American government in Guatemala in 1954. They have disagreed on the influence of the United Fruit Company, the potential role of Soviet influence, and the degree to which American officials simply misinterpreted social reform for Soviet backing. Newly declassified Central Intelligence Agency documents show the United Fruit Company played no major role, that Soviet influence was minimal, and that the Eisenhower administration did not need to be forced into the action by any lobby groups. Arbenz was elected without a secret ballot. He considered himself a communist and joined the Communist Party in 1957. His land reform, designed by the Communist Party, was ruled unconstitutional by the Supreme Court, which he then purged. His regime openly praised Stalin, relied on the communists for key decisions, and received arms from the Soviet bloc. He killed hundreds of his opponents. The CIA intervened because it feared that a communist dictatorship would become a Soviet beachhead in the Western Hemisphere. The Truman administration began developing contingency plans to remove Arbenz in 1952, in the event that he became a threat to American interests in the region. In the face of widespread popular discontent in Guatemala and mass protests organized by the Catholic Church, the CIA used black propaganda to spread panic among the population. In the midst of a low-level internal civil war, the Eisenhower administration mobilized disaffected Guatemalan exiles to invade the country from neighboring Honduras. Arbenz, a fighter until the end, donned his colonel's uniform and prepared himself for war with the United States. Ultimately, however, there was very little fighting at all; the military failed to support Arbenz due to its own concerns over his perceived radicalism. The US-armed rebellion quickly took over the country, to the surprise of the CIA, which had expected much fiercer resistance. With the army promptly joining the revolt, Arbenz fled the country in a panic. He was allowed exile by the new regime. Vice-President Richard Nixon praised the new elections held by the military regime, declaring that Guatemala represented "the first time in history that a Communist government has ever been overthrown and replaced by a free one." However, Guatemala would be plagued with instability for decades. A series of military coups rocked the country, as Soviet and Cuban support for Communist violence caused bloody civil strife. After a 1982 coup, Guatemala was placed under a US arms embargo imposed on human rights grounds. A vicious genocide reminiscent of the mass killing of the Hmong in Laos was then carried out against the Mayan Indians, in which scores of thousands were massacred. Che Guevara, an Argentine citizen living in Guatemala, was outraged by the coup. He vowed to fight for Marxist revolution elsewhere in Latin America. Arbenz, a disillusioned radical, moved initially to Mexico and then to Cuba, where he celebrated the Castro "revolution" and cheered on Communist guerillas throughout the continent. Eisenhower suffered a heart attack in 1955. In response he learned to control his hot temper, maintain his proper weight; stop smoking cigarettes; measure his blood pressure and blood cholesterol levels; manage anxiety, depression, and fear; and handle worry and stress. He learned to recognize skipped heart beats, too rapid pulses, and the need for the occasional use of nitroglycerin. Ike’s chief cardiologist, Dr. Paul Dudley White, declared in February 1956 that there was no medical reason why Eisenhower could not serve another term. These reports reassured the public, but new concern arose in June when Eisenhower had to undergo emergency abdominal surgery because of an ileitis attack. Although the President recovered fully and quickly, many voters wondered whether Eisenhower could withstand the rigors of a second term. Eisenhower had told close friends that he hoped to retire after a single term, because of his age (66), his desire for the emergence of new leadership in the GOP, and his conviction that he had performed his duty to his country. Yet after his heart attack Eisenhower could not think of a single Republican in whom he had confidence who could win the presidency. He doubted whether Nixon was ready enough for the presidency. Such ruminations persuaded Eisenhower by the beginning of 1956 that there really was no alternative to his running again to guarantee the nation's well-being. Ike worried that Nixon might be a political liability, but across the land Republican regulars loved Nixon's strident, partisan rhetoric. Nixon refused to take a cabinet post and Eisenhower could not dump him. At the San Francisco convention the delegates chose Nixon with only one dissenting vote. At the beginning of the campaign, two-thirds of the voters approved of Eisenhower's performance in office. Eisenhower's high standing was based on peace and prosperity—securing an armistice in the Korean War, meeting with Soviet leaders at Geneva in 1955 in the first East-West summit conference since 1945, avoiding war in Vietnam, and presiding over a robust economy and a complacent society. Eisenhower was eager to run on this record; his campaign slogan was "Peace, Prosperity, and Progress." Stevenson, a weak campaigner lacking Ike’s charisma, was the Democratic front runner because no senior Democrat wanted to be run over by the Eisenhower Express. His only major opponent was Senator Estes Kefauver of Tennessee, whose progressive views on civil rights and crusading investigations of organized crime had made him popular with liberals, reformers, and those weary of politics as usual. Kefauver won in New Hampshire on 13 March and a week later pulled off a stunning upset in Minnesota. The two men debated on 21 May, the first nationally televised presidential debate. Stevenson won narrowly in the Florida primary and then won a landslide victory in California that proved decisive. The delegates voted for Kefauver over John F. Kennedy as the vice presidential nominee. Stevenson found it impossible to dent the President's enormous popularity, even when warning about Ike’s dubious health (in fact Eisenhower, who was ten years older, outlived Stevenson). He criticized Eisenhower for using nuclear fears to keep the peace, settling for prosperity that excluded many farmers and small businessmen, and exulting in "progress" that forced children to endure a shortage of schools and teachers. Stevenson, a conservative on racial issues, ignored civil rights, as did Eisenhower. Stevenson ridiculed Eisenhower for narrow, weak, and even indolent leadership, quipping that the President devoted more energy to his golf game than to driving important legislation through Congress. Stevenson offered spending proposals to raise the quality of life by providing federal aid for educational programs, medical research, economic development of depressed areas, and health care for the elderly. Few voters paid attention. Stevenson blundered by calling for suspension of nuclear testing and termination of the draft: he thereby highlighted defense issues that were Eisenhower's long suit. Stevenson argued that neither reform would weaken national defense. The American nuclear arsenal could already obliterate the Soviet Union many times over and so there was no need to poison the atmosphere with nuclear fallout; a switch from conscription to an all-volunteer force would result in longer terms of service and improved readiness in armed forces dependent on ever more sophisticated military technology. Stevenson advocated both proposals because he thought they were right rather than politically popular, but he never imagined how badly they would backfire. Eisenhower firmly replied that the United States could not maintain adequate military forces without a draft. Three weeks before the election the Soviet Premier endorsed Stevenson’s test ban; it was a kiss of death. Nixon condemned Stevenson as an appeaser, while Eisenhower, a five-star general, scorned his challenger for injecting a delicate international issue into the campaign. World crises erupted in the Suez and Hungary in the final days of the campaign. When Egypt nationalized the Suez Canal, Britain, France, and Israel launched a coordinated, surprise military attack to seize the canal, without consulting Washington. Eisenhower insisted on a cease-fire that humiliated the British and French. Meanwhile, the Soviets sent 200,000 troops to break the Hungarian freedom movement. Eisenhower condemned the Soviet invasion, but there was nothing he could do to stop it. Stevenson, with scant experience in world affairs had no alternative policy, as the nation rallied behind the world leader in the White House. On election day, Eisenhower won a landslide victory, with a plurality of almost ten million votes with 57.6% of the popular vote, a gain of 2.5%, and carried 41 states with 457 to 73 electoral votes. The Democrats held most of the Solid South, but little else as cities, suburbs, and farms and nearly every major social and economic group rallied to Ike. However it was a personal triumph with short coattails, for Eisenhower was the first winner since 1848 to see his party lose both houses of Congress. The election of 1956 was an individual victory for Eisenhower, a resounding vote of confidence in one of the most popular Presidents in American history. In 1958, however, the country was suffering a sharp recession, intensified by major strikes. The Democrats won a sweeping landslide to control large majorities in Congress. The surprise launch of Sputnik, the first satellite around the earth by the Soviets in 1957 caused a major crisis and a rethinking of national goals in missile technology and science education generally. Eisenhower set up a civilian agency, the National Aeronautics and Space Administration (NASA), to carry out a highly publicized program of space exploration that would counteract the Soviet success. Five interest groups pressed Eisenhower for more aggressive action: a loose federation of physicists and astronomers interested in advancing basic research; the Pentagon, which wanted to use NASA's scientific discoveries to understand Soviet threats; engineering corporations who foresaw a large aerospace industry; space flight enthusiasts eager to pursue exploration beyond atmosphere; and politicians who wanted to restore national prestige. It should be noted that Sputnik being launched first was due to a conscious decision on the part of Eisenhower earlier, as he worried that America launching a spy satellite first, due to it technically contradicting some aspects of international law, would result in several Soviet-orchestrated international protests in response. He also prevented Werner von Braun from doing a planned launch of a satellite on January 1957, well ahead of Sputnik's launch. The Air Force reacted to Sputnik by developing a series of new bomber systems to keep pace with new missile systems, notably air-to-surface missiles, the B-52, and the B-70. Eisenhower vacillated on the B-70, and John F. Kennedy later canceled the program because it was technically questionable and too expensive. Eisenhower proposed a federal highway system in 1955, but Congress rejected it because of financing issues. The multiple interests groups came together in 1956 to pass the Federal Interstate Defense Highway Act, also known as the National Highway Act. The federal government paid 90% of the cost, which was passed along to users as the new Highway Trust Fund collected new taxes on fuels, tires, and vehicles to achieve pay-as-you-go funding. The 42,000-mile interstate highway system, largely completed in 25 years, integrated the nation into a single transportation system. Truckers saved enormous amounts on fuel and travel time, which reduced shipping costs and led to large-scale productivity gains, while driving another nail in the railroad coffin. Passenger traffic soared, opening up new horizons for vacations and job searches, and new ways for extended families to come together. Much of the traffic was short-distance, as the interstates opened up the outer suburbs around all major cities. The U.S. already had the world's best road system; the interstates made another quantum leap in the most modern transportation system in the world. Eisenhower is given the credit for the Interstate Highway System. Eisenhower's farewell address on 17 January 1961 warned the nation against depending on an economy that was based on a military-industrial complex. Written by political scientist Malcolm Moos with help from brother Milton Eisenhower, the speech echoed the president's conviction that wars must be made obsolete. While he believed that the Soviet threat was being exaggerated, President Eisenhower argued for sufficiency, not superiority. The "Military-industrial complex" became a slogan used by the New Left in the 1960s to attack American capitalism, and became a standard ingredient of Soviet propaganda. Eisenhower's legacy was victory in wartime, prosperity and peace afterwards. He was totally committed to the core republican values of civic duty and common sacrifice. Throughout the war he called for voluntary self-restraint and obedience to duty, which he called the first tenet of his religion. His apocalyptic view of World War II was based on a dualism that pitted the selfish against the selfless. He saw the war largely as a spiritual struggle within the Allied camp between these two forces. Civilians as well as soldiers were exhorted to sacrifice personal interests for the sake of total mobilization, which meant exercising the virtue of selflessness. He interpreted fascism as a manifestation of selfishness and social disorder. As a soldier, his legacy includes common sense, caution, exhaustive planning, collaboration with allies, superb diplomatic timing, avoidance of casualties, and respect for the common soldier. As president his legacy was moderation, a sense of inclusiveness, a rejection of fear and paranoia, dedication to selecting the best experts, a disdain for partisanship, a commitment to entrepreneurial freedom, an abhorrence for war, a love of democracy and a long-term sense of national greatness. The "Eisenhower Era", 1953-1963, marked a decade of peace and prosperity, with an end to the bitter conflicts regarding class and ideology that marked the 1940s, and before the even more violent and bitter years of the 1960s. People look back with nostalgia, and gratitude for the man who kept the peace and quiet. Opened in 1966, the Dwight D. Eisenhower presidential library at Abilene, Kansas, houses Eisenhower's presidential papers, collections of papers of 350 of his associates, and records of White House agencies that functioned during his presidency. The library also holds photographs, motion picture films, and Eisenhower memorabilia, and sponsors meetings of scholars to discuss Eisenhower and his era. Boyle, Peter G. Eisenhower. (Profiles in Power Series.) (2005). 200 pp. Chernus, Ira. General Eisenhower: Ideology and Discourse. (2002). 366 pp. Gelb, Norman. Ike and Monty: Generals at War. (1994). 480 pp. Pickett, William B. Eisenhower Decides to Run: Presidential Politics and Cold War Strategy. (2000). 215 pp. Rostow, W. W. Pre-Invasion Bombing Strategy: General Eisenhower's Decision of March 25, 1944. (1981). 166 pp. Allen, Craig. Eisenhower and the Mass Media: Peace, Prosperity and Prime-Time TV. (1993). 259 pp. Lee, R. Alton. Eisenhower and Landrum-Griffin: A Study in Labor-Management Politics (1990). Rose, Mark H. Interstate: Express Highway Politics 1941-1956 (1979), 169 pp. Saulnier, Raymond J. Constructive Years: The U.S. Economy Under Eisenhower (1991). Warshaw, Shirley Anne, ed. Reexamining the Eisenhower Presidency. (1993). 234 pp. Borhi, Laszlo. "Rollback, Liberation, Containment, or Inaction? : U.S. Policy and Eastern Europe in the 1950s"
Carter, Donald Alan, "Eisenhower Versus the Generals," The Journal of Military History 71 #4 (October 2007) pp 1169–1200. Divine, Robert A. The Sputnik Challenge: Eisenhower's Response to the Soviet Satellite (1993). Geelhoed, E. Bruce and Edmonds, Anthony O. Eisenhower, Macmillan, and Allied Unity, 1957-1961. (2003). 196 pp. Hewlett, Richard B. Atoms for Peace and War, 1953-1961: Eisenhower and the Atomic Energy Commission (1989). Kingseed, Cole C. Eisenhower and the Suez Crisis of 1956. (1995). 166 pp. Rabe, Stephen G. Eisenhower and Latin America: The Foreign Policy of Anti-Communism (1988). Rosenberg, Victor. Soviet-American Relations, 1953-1960: Diplomacy and Cultural Exchange during the Eisenhower Presidency. (2005). 324 pp. Roman, Peter J. Eisenhower and the Missile Gap. (1995). 264 pp. Gallup, George Horace, ed. The Gallup Poll: Public Opinion, 1935-1971 3 vol (1972) summarizes results of each poll as reported to newspapers. Eisenhower Papers 21 volume scholarly edition; complete for 1940-61; volumes XIV-XXI covering 1953-61 are online. Eisenhower, Dwight D. Eisenhower: The Prewar Diaries and Selected Papers, 1905-1941. ed. by Daniel D. Holt and James W. Leyerzapf, (1998). 576 pp. ↑ The Eisenhower Presidential Library and Museum Homepage. Eisenhower.utexas.edu. Retrieved on May 3, 2010. ↑ "General of the Army," the highest American military rank, is a 5-star general, comparable in rank to field marshal; there have been only five in history. ↑ FDR told Marshall he was essential at home, thus allowing Marshall to save face. FDR felt Eisenhower was the better planner and diplomat. ↑ Internet archive, Eisenhower Campaign Spots (1952). Retrieved on 2007-09-11. ↑ Taylor retired and counterattacked, writing that Eisenhower's policy "offers no alternative other than reciprocal suicide or retreat in the face of the superiority of Soviet forces." [Taylor, The Uncertain Trumpet (1959) p. 137] President John F Kennedy greatly admired Taylor’s ideas and brought him back as chairman of the Joint Chiefs in 1962. ↑ Cathal J. Nolan, "The Last Hurrah of Conservative Isolationism: Eisenhower, Congress, and the Bricker Amendment" Presidential Studies Quarterly 1992 22(2): 337-349. ↑ Piero Gleijeses, Shattered Hope: The Guatemalan Revolution and the United States, 1944-1954 (Princeton University Press, 1991), pp84, 147, 145, 155, 181-2, a virtual hagiography of Arbenz. ↑ The Politically Incorrect Guide to the 1960s, pp 118-9. This page has been accessed 138,184 times.